Before the Iraq invasions in 1991 and 2003 Britain was involved in military operations in the region in both world wars. 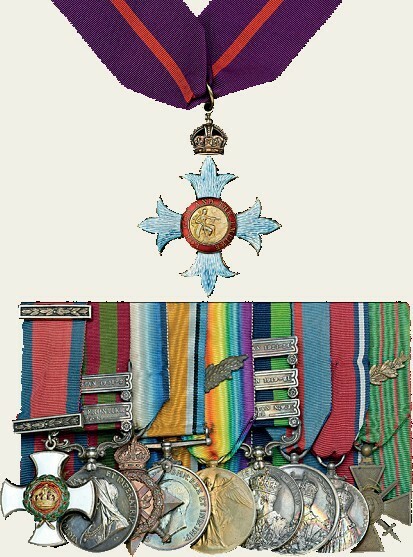 An Afghanistan 1919 CBE, and ‘Relief of Kut 1916’ immediate DSO group to Colonel ME ‘Doppers’ Dopping-Hepenstal, 1st KGVO Gurkha Rifles, estimated at £3000-5000 at Dix Noonan Webb on December 5-6. While the 1941 action was a limited affair, in the First World War hard fighting against the tough soldiers of the Ottoman Empire resulted in one of the British Empire’s worst defeats. And that’s ignoring Gallipoli, against the same foe. A medal group coming up at the Dix Noonan Webb auction in London on December 5-6 reveals the story of the Kut disaster in 1916. Estimated at £3000-5000, pictured above, is an Afghanistan 1919 CBE, and ‘Relief of Kut 1916’ immediate DSO group of 10. It was awarded to Colonel ME ‘Doppers’ Dopping-Hepenstal, 1st KGVO Gurkha Rifles (The Malaun Regiment). He was three times wounded – receiving the Croix de Guerre from the French government for rescuing French civilians and troops from a burning farmhouse in 1915, being badly burned in the process. In 1916 Col Dopping-Hepenstal was part of the third relief force trying to fight its way through to General Townshend’s force trapped by the Turks north of Basra but short of Baghdad. After fierce fighting and a five-month siege, on April 29 Townshend surrendered his force. The British-Indian force had suffered 23,000 casualties over the three relief attempts. Thirteen thousand soldiers were captured. As soon as one war ended, Col Dopping-Hepenstal was soon in action in the Third Afghan War.